Sade Construction Limited. Established in 2006 by Erdogan (Eddie) Sonmez and Ugur Guler who both worked and trained in Istanbul, in recognition of the need for good quality developers in Kalkan, and in response to the demand for homes built to a high standard. Using their previous experience and knowledge Sade Construction soon established itself as one of the major developers within Kalkan. We are not a real estate agent but a construction company. We therefore only offer for sale our own properties, or off-plan projects as we guarantee every aspect of our work. We remain fully responsible to you the customer, from project inception right through to completion and beyond. Due to our unique position of offering our properties directly to you the customer, we are able to operate on a No Commission basis as well as providing a 5 year buildings guarantee. We recognise that purchasing a second home is a big committment therefore for your peace of mind, we utilise the services of a local solicitor who specialises in property sales to foreign nationals. All contracts are in both English and Turkish and fully explain our commitment to you and the sales process. Our offices are situated in the centre of Kalkan and staffed by professional, qualified staff who are fluent in both Turkish and English, as well as having a thorough knowledge of the buying process. As we are based in Kalkan 365 days a year, apart from the odd day off, we are contactable all year which is important for any after-sales questions and maintenance of your property. With our ability to understand the needs of people have incorporated our high standards into a number of successful projects, ranging from new builds such as Patio Homes, to sympathetically restored renovation projects such as Elite Apartments. Based in central Kalkan, Elite was completed in 2007 and proved extremely popular with all apartments selling quickly. Demand continues for these apartments with re-sales being sought after. Working in partnership with other professionals within Turkey and UK, we have been able to use our skills and experience to help develop a number of other successful projects such as Kalkan Mountain Villas in Islamar. A unique project of villas set against a backdrop of some of the most stunning natural scenery in the region.‘Sade’ which in Turkish means ‘simple’, is our company philosophy and distinguishes us from our competitors. All our builds incorporate simple yet striking designs, modern clean lines, neutrally furnished and spacious. 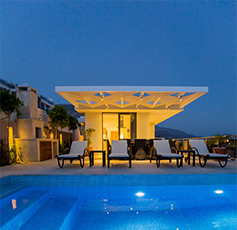 We pride ourselves on our sophisticated style and our properties remain unrivalled within Kalkan. Our success over the years we believe is based on this philosophy but also the added value we incorporate into each and every build by using first class building products and workman, as well as offering a superior maintenance package once you have purchased. A copy of which is available upon request. We are more than happy to provide any information you require prior to making your purchase. Due to our unique position of offering our properties directly to you the customer, we are able to operate on a No Commission basis as well as providing a 5 year buildings guarantee. We recognise that purchasing a second home is a big commitment therefore for your peace of mind, we utilise the services of a local solicitor who specialises in property sales to foreign nationals. If you are interested in seeing our developments for yourself, Sade Construction Limited will happily arrange your visit. We have several apartments and villas available for rent and can arrange airport transfers as required. 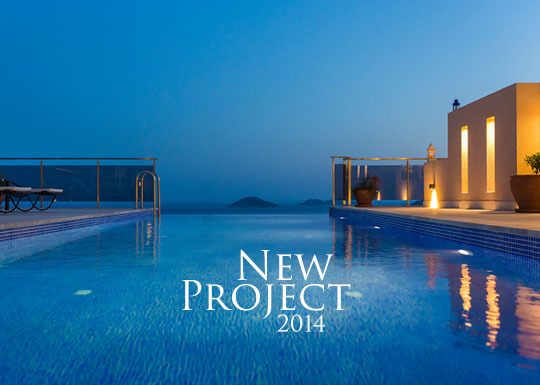 You can enjoy a relaxing holiday in kalkan and visit our projects and properties. Viewing at your convenience. Copyright 2014 Sade Construction Ltd. Co. All rights are reserved.